So yea, not a surprise. As the name implies, 360 view provides fantastic panoramic views (360 horizontally and 160 vertically) of any given image within the 360 View coverage area (initially 30 cities and 15 suburbs across the United States with more to come). We have studied our industry, gleaning tidbits here and there, and polled our customer base in creating a simple, easy-to-use interface that fits seamlessly into the MapQuest mapping experience you have come to know and understand. Best of all, MapQuest 360 View “just works” without requiring any 3rd party player downloads. Take that Bing Maps and your 3rd party player download. MapQuest works without any Silverlight player to get in your way… except of course it uses a 3rd party player called Flash. I suppose this plays into Adobe’s assertion that their 3rd party player download is included by default in many browsers by default. Still it looks good and appears to have been taken sometime last year (the light rail line isn’t running yet in Phoenix and most stations haven’t been built yet. 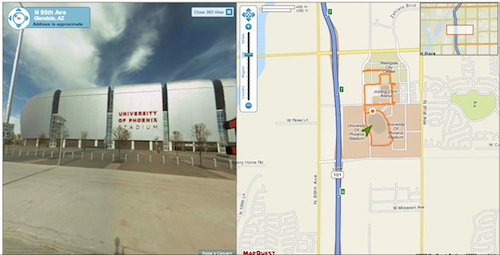 A view of University of Phoenix Stadium where you’ll be seeing the true national championship; TCU vs BSU. 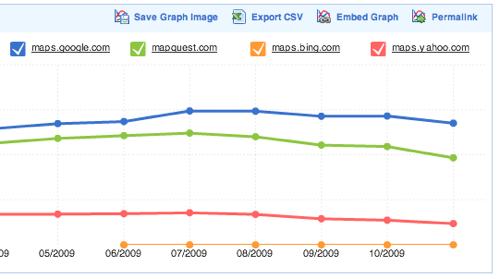 Yep, Bing and Yahoo don’t add up to MapQuest’s reach. I think it is critical to get this functionality into their API before more companies abandon it for Google While traffic numbers trend down over the last 6 months, I’m not sure it is losing to Bing or Yahoo.